Beatles fanatics need to head to Las Vegas, Nevada. The ultimate Beatles tribute show, The Fab Four is available for those who are lucky enough to get tickets to this amazing performance. The Fab Four show Las Vegas is one of those shows you simply have to see to appreciate. The Fab Four showroom is conveniently located at the Planet Hollywood Hotel's V theater on the Las Vegas Strip. You will want to get your tickets for this show in advance. 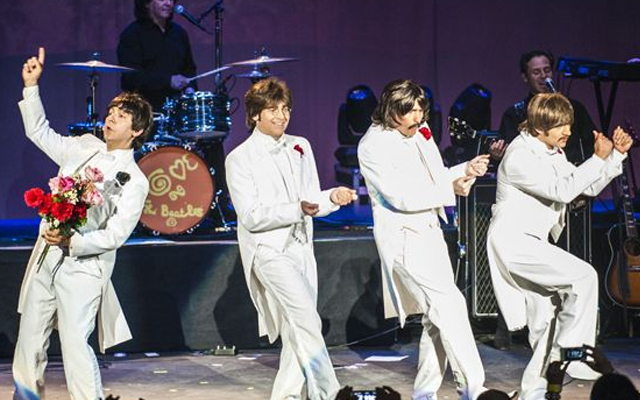 The Fab Four offers the best Beatles impersonators the world has ever seen. In fact, just watching, listening, and seeing the show will bring back fond memories of John, Paul, George, and Ringo, the ultimate 'Fab Four' in their heyday. 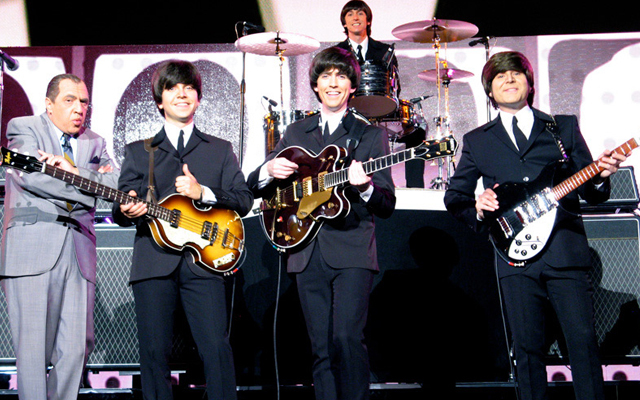 The cast is comprised of Frank Mendonca III (Paul McCartney), Gavin Leslie (George Harrison), Tony Felicetta (Ringo Starr), Steven Craig (John Lennon), and Paul Terry (Ed Sullivan). "The Fab Four" is not just known for its dead on sound (impersonating the most famous band of all time, the Beatles). The performers are also meticulous in every aspect of taking on the persona of the performers. Attention to detail has been perfected by the performers of this show. The cast looks like the Beatles. They sound like the Beatles. They act like the Beatles, and many audience members have sworn they were seeing the Beatles when they saw "The Fab Four". The Fab Four Las Vegas performs the Beatles songs with a sound that rivals that of the original band. You will find the sound so uncanny it is said to "send chills down audience members' spines". This sound is so authentic, and yet it is done live without the assistance of backup tracks, sequencing, and Beatles tapes. “The Fab Four” tribute show has been a hit in various countries across the world including Hong Kong, Brazil, Malaysia, Mexico, and Japan. 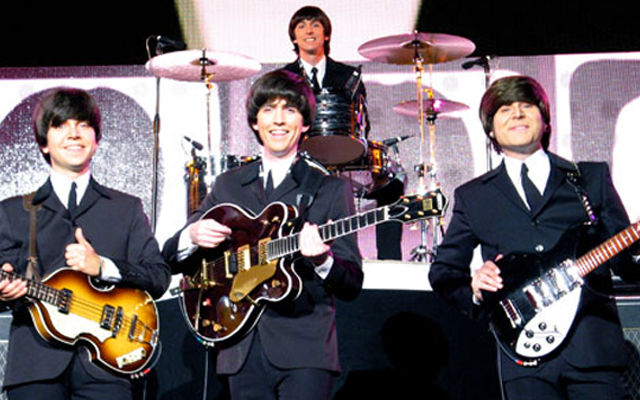 You can see “The Fab Four” in Las Vegas at the Planet Hollywood every Saturday through Thursday. There is one show per night at 6:00 PM. The theatre is dark on Fridays. V Theater at Planet Hollywood Hotel: 3663 Las Vegas Blvd. SouthSuite 360 Las Vegas, NV, 89109. This is an absolutely incredible show! This is an absolutely incredible show! The talent is superb. These performers have done their homework and it shows. If you have the opportunity to catch this show - Do so. You\'ll walk out of the theatre marveling at the musicianship and accuracy of the performers. Do It! I had seen these guys on TV/KPBS here in San Diego about a year ago and I was very impressed by their musical accuracy and performance. I just saw them live at Planet Hollywood (formerly the Aladin)in Las Vegas this December 15. Hearing these guys live is the ultimate tribute to "The Beatles" as their performance is flawless and their sound is tight as any Beatles recording you ever heard. The V Theatere inside Planet Hollywood, holds a small audience of around 250 people and this group should be playing at Caesar's Palace to a sold-out packed house. I wish the show would play more songs and less talk/jibberish from an Ed Sullivan character to a longer set time frame. Any Beatles fan would appreciate more music from this guys. The Fab Four are that good, better than anything playing in Las Vegas. While headliner quality has greatly diminished in Las Vegas, "The Fab Four" outshine any headliner, this is the must see show in Las Vegas!! Thank You Fab Four: Robert V in San Diego, CA.